Regina Kapinga is the Head of Advocacy and Resource Mobilization. 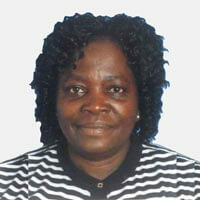 Regina, a Tanzanian, holds a PhD in Agronomy (major – adaptive breeding and crop management, 1994) and an MSc in Crop Science (1988) from the University of Ibadan, Nigeria. She obtained her BSc (major in Botany and Chemistry, 1984) at the University of Dar es Salaam, Tanzania. Previously, she was the Senior Program Officer (2012–2015) and Program Officer (2009–2012) with the Bill & Melinda Gates Foundation, Seattle, Washington, United States. She held the post of Sweet Potato Breeder for sub-Saharan Africa and VITAA Partnership Program Coordinator (2001–2009) at the International Potato Center (CIP) – sub-Saharan Africa region in Kampala, Uganda. She had served as the Director of Research Coordination and Promotion at the Tanzania Commission for Science and Technology (COSTECH, 2000-2001), and Root Crops Research Scientist and National Coordinator for Root and Tuber Crops Improvement Program (1984-2000) at the Ministry of Agriculture, Food Security and Cooperatives, Mwanza, Tanzania.